There are times when your eyes are opened to a whole new realm that exists within fly fishing and you almost feel like a child. Not in a scolding way, more of an awakening to a whole new world of possibilities. That is how I feel after receiving a copy of The Soft-Hackled Fly and Tiny Soft Hackles By Sylvester Nemes from Ray Rivera for my birthday. Clearly that is a lofty goal for a book that is only 214 pages long in its second edition. What I find even more shocking is that the first edition was only about 127 pages long and even in that I truly felt that Mr. Nemes had succeeded in accomplishing his goal, at least to me. I am not the most proseful reviewer in the world but I will do my best to flesh out what I have found to be the most important aspects of his writings. The book starts with a very interesting introduction to Mr. Nemes and his first experiences in fly fishing along with the descriptions of fishing the River Test during his service in England during World War II. That fact alone makes the influence that Mr. Nemes holds to be amazing to me being one of the few American servicemen who was allowed to fish the River Test when it was held for private use only for the English gentry. Mr. Nemes also picks up on some really fun little details in regards to how he learned to set the hook on a fish. And lest we as fly fishers forget that there are 24 hours in a day he does give a little bit of his experiences fishing at night. Mr. Nemes apparently started out with very little knowledge about flies and started out with soft hackles. We also get introduced to the fact that soft hackles don’t really represent anything yet also represent anything. (Similar in fact, to kebari flies in the realm of Tenkara.) The reader also gets introduced to fourteen of Mr. Nemes favorite flies along with the recipes. Even with fourteen patterns to choose from the author continues to mention 3 of his apparent go to flies in each and every chapter. These flies in terms of material needs resemble the minimalistic kebari patterns that your every day Tenkara angler will use. The three flies that were his go to flies are the Partridge and Orange, Partridge and Green, and the Partridge and Yellow. After a brief introduction to tying a soft hackle fly with and without a dubbed thorax, we move on to how to Mr. Nemes fished his soft hackled flies and what kinds of waters he found that worked for each pattern in his opinion. Mr. Nemes also focused on the fact that he found that when he fished the patterns that drifting downstream was the tactic that worked best for him. The remaining chapters in this tome of awesomeness are about different soft-hackle patterns and how to fish each fly. In conclusion, if you are looking for a new book on fly patterns this is it!!!! Thanks guys for teh great comments. I am glad that I am able to help give you a few more things to read. There is plenty more coming in the very near future. Graham, Thanks for sharing will grab a copy. Always looking for a good read to add to the collection. Nice post! Hey Graham, thanks for this post. I've just discovered soft hackles and I'm slightly enamored right now with possibilities I've never explored before. Thanks again and I'm going to find that book. 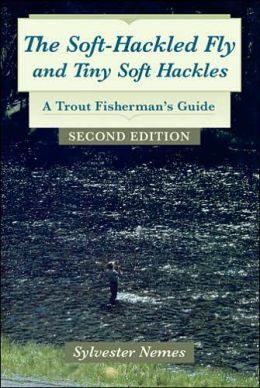 This was one of the first books I read on fly fishing and I found it to be very enlightening. Whether you are a tenkara enthusiast or not this book should almost be required reading.